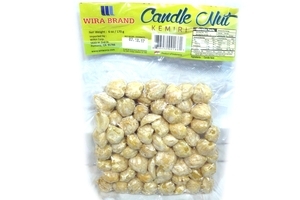 Wira Food Candle Nuts in 6oz (170g) pack. Candle nuts also known as Biji Kemiri, Buah Keras, Lumban and kuki. Candle nut is used to make a thick sauce that is eaten with vegetables and rice. All Natural ₪ . Product of Indonesia. Halal Certified حلال . Candlenut oil might be used as both a laxative and a treatment for diarrhea. The oil might also be used as a hair-growth stimulant, a cholesterol-lowering agent, a weight-loss supplement and an arthritis treatment. Extracts made from the candlenut also act as antibacterial agents. The leaves of the candlenut tree have been used to treat headaches, fevers, stomach ulcers and gonorrhea. The flowers and sap can be used to treat oral candidiasis, and the bark has been used to treat tumors. I am a non-Asian American and I bought a package of Wira Brand Candle Nuts from an Indonesian market in Los Angeles, CA and I ate a few from the bag and later I got sick and vomited. The next day I went on the internet and googled Candle Nut Toxicity and found out that these are not to be eaten raw. There should be a warning on the label about this!